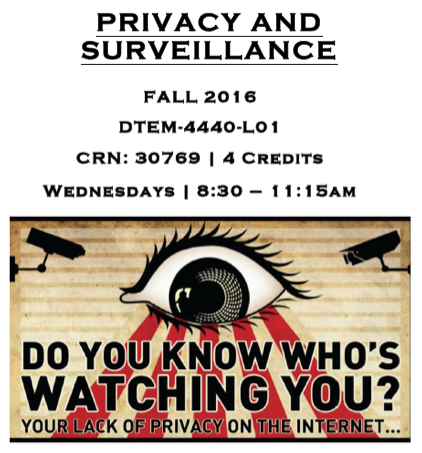 Fall ’16 Course: Privacy and Surveillance- NOW Open for Registration! Claudia Rivera May 3, 2016 May 3, 2016 No Comments on Fall ’16 Course: Privacy and Surveillance- NOW Open for Registration! Today’s news headlines are filled with reports of new threats and invasions to privacy. This course will explore the domestic and international development of data privacy law and policy and focus on issues of privacy, security and the emerging regulations that establish fair information practices for the Internet, online platforms, media institutions and global electronic commerce. Particular attention will be given to technologies that can invade as well as protect personal information and the relationship between those technologies, technical architectures, information ecosystems, and data protection. Focused class research exercises and/or case studies will be a core part of the course to immerse the substantive material into real-life scenarios and provide practical experience to students. This course fulfills the Ethics, Law and Policy (ELP) requirement required of all four new proposed Communication and Media Studies majors. This course fulfills the “Ethics, Law and Policy” requirement. Summer ’16 Course @ LC Campus: Intro to Media Industries NOW Open for Registration!